Modern Misting Systems understands your need to provide the best experience possible for each of your customers with our commercial misting systems. If you provide products and services to your customers in an outdoor or semi-outdoor environment, the desert heat will impact that experience in a dramatic way. 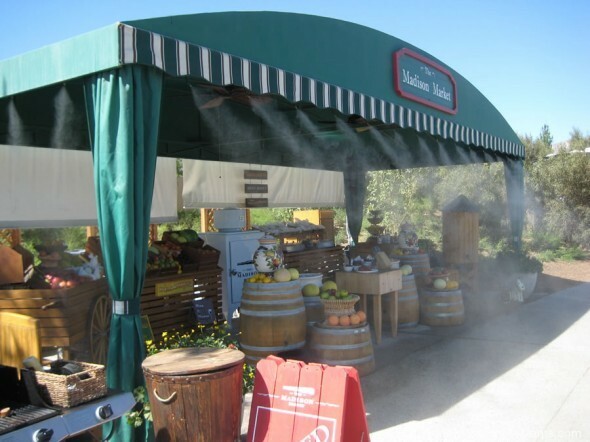 Whether your outdoor space is large or small, we can design, build and install commercial misting systems for you that both maximize the comfort factor and minimize the cost to deliver it. For larger commercial applications, many advances in misting pump technology today allows for variable delivery of the cooling mist. We can design and build a system for you that both allows for “zones” to run independently or simultaneously, as well as employ variable speed technology to regulate the cooling mist. This means you do not pay to run a system where there is no one to enjoy it. From minimum settings to maximum delivery, the variable delivery misting systems we build are the best solution for your outdoor space. See our Commercial photo gallery for more great photos!